Hodgson et al. have successfully synthesised cubebol, a biomolecule and sesquiterpene of potential use as cooling reagent in culinary applications. Not that it is the first total synthesis of this compound, many methods have been published (Yoshikoshi 1972 DOI, Okamoto 1976 DOI , Fürstner 2006 DOI, Fehr 2006 DOI ) but this one starts from menthol and is particularly short. It is also solves an outstanding problem in menthone chemistry first encountered by Ludwig Claisen in 1894 (DOI). 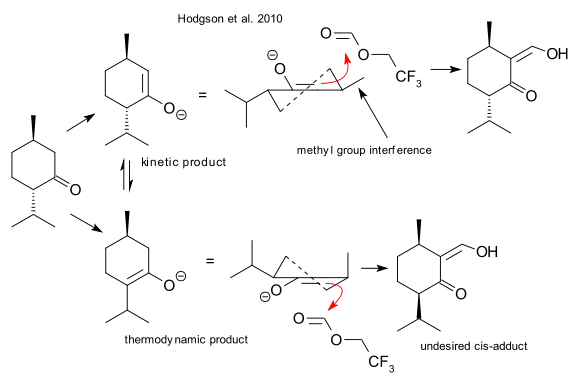 Menthol 1 was oxidized to menthone 2 using calcium hypochlorite, formylation took place next with 2,2,2-trifluoroethyl formate and LDA (DOI) to enol 3 and reaction with lithiumaluminumhydride to exocyclic alkene 4 was a tandem of elimination and reduction. Allylic chloride 5 was obtained reaction with MsCl / triethylamine / LiCl, a Grignard reaction with chiral epichlorohydrin (Mg, CuI, THF) gave alcohol 6 , cyclopropanation to 7 was accomplished using BuLI / TMP (DOI), oxidation to ketone 8 required TPAP / NMO and finally a methyl group was introduced forming (-)-cubebol 9 using MeLi / caesium chloride. Regular menthone formylation using an alkoxide is accompanied by epimerization of the isopropyl group and formation of the cis product (apparently already observed by Claisen with another formylation agent) which is undesirable. In a simple mechanistic picture this compound results from the thermodynamic product. The low-temperature LDA method -according to Hodgson et al. - favors the kinetic product despite methyl group interference.